David Herman (also known as Dave Herman) is an American actor and comedian, who provides many voices for recurring and one-time characters on Futurama, including Leela's father Morris and Scruffy the janitor. 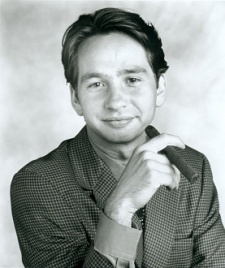 Outside of Futurama, David has often collaborated with writer and director Mike Judge, appearing in his animated series King of the Hill, The Goode Family, and the short-lived revival of Beavis and Butthead, and notable roles in the Mike Judge movies Office Space and Idiocracy. In addition, he was one of the original players on MADtv (along with fellow Futurama voice actor, Phil LaMarr), was the voice of narcissistic, incompetent park ranger Steve Williams on Comedy Central's Brickleberry, and has lent his vocal and acting talents to numerous television shows, movies, and video games. John DiMaggio and Billy West often talk about how they would like to have him in a commentary. Billy explained Herman does not participate in them because he lives in Texas and cannot afford to travel, presumably for something he will not be paid for. However, he has since participated in commentaries for Volume 5. A list follows. David Herman is the voice of two mayors — Mayor Poopenmeyer and the Lord Mayor of Cologne. This page was last edited on 24 November 2016, at 16:43.